Formula 1 world champion Lewis Hamilton says Mercedes team-mate and title rival Nico Rosberg helped push him to new levels but admits it was tough to make their relationship work. He also had a turbulent time at McLaren in 2007 with team-mate Fernando Alonso. But Hamilton says his 2014 experience with Rosberg was "maybe tougher" after the pair clashed on and off the track. He added: "But you always want to have a fierce competitor, a tough team-mate, because they help you raise your game." Hamilton, 29, beat Rosberg to the title after months of tension between the Mercedes team-mates following several controversial incidents. Rosberg and Hamilton have had a fractious relationship after Hamilton's brake failure in Canada, Rosberg taking a controversial pole in Monaco, the German clipping Hamilton in Belgium, and Hamilton's "slap in the face" overtake of Rosberg in the USA. But Hamilton says the year ended on a "really respectful note" in Abu Dhabi. Bernie Ecclestone has done an "incredible job" running Formula 1 and he is still "the man for the job"
A third world championship win in 2015 would take Hamilton level on titles with Ayrton Senna, who won in 1988, 1990 and 1991. 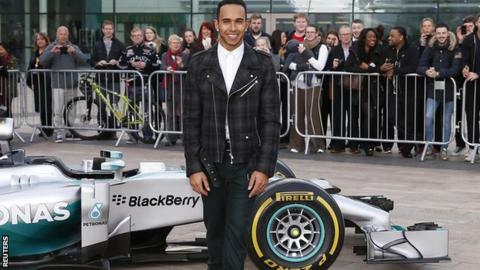 Hamilton has maintained the Brazilian driver has been his inspiration in the sport from a young age. "Naturally I always wanted to emulate Ayrton," Hamilton said. "Right now, I'm really humbled by the whole experience, I was grateful just to get the first win, to get the second is just an unreal feeling. "This is a once-in-a-lifetime opportunity. But I'll be back at the factory next week, we're going to be working on the next car, and a new seat fit - a big engineering meet to understand what's entailed for next year." On Jenson Button, who is still without a team for the 2015 season, Hamilton added McLaren would be "smart" to keep him. "Developing, building a team, stabilising a team, you need strong drivers to lead the team, and he's the full package," Hamilton said. Hamilton was also questioned on the financial problems faced by Formula 1's smaller teams towards the end of the 2014 season, with British manufacturers Caterham and Marussia entering administration within a week. "We need those two teams, because they really make the sport, we need more teams and we need more competitive teams. "Seeing people lose their jobs is not a good thing at all. Of course these guys they want to be racing, they want to get to races and see their car competing even if it's not winning. "My heart goes and my best wishes go out to those guys."